Proving that bigger isn’t always better, tiny houses have been popping up all over the world recently and inspiring us all to downsize our lives. Not only are they just too damn cute for words, they’re also environmentally friendly, and can be fitted out with all the conveniences of a standard home, without the scary price tag. Did someone say no mortgage? Where do we sign? 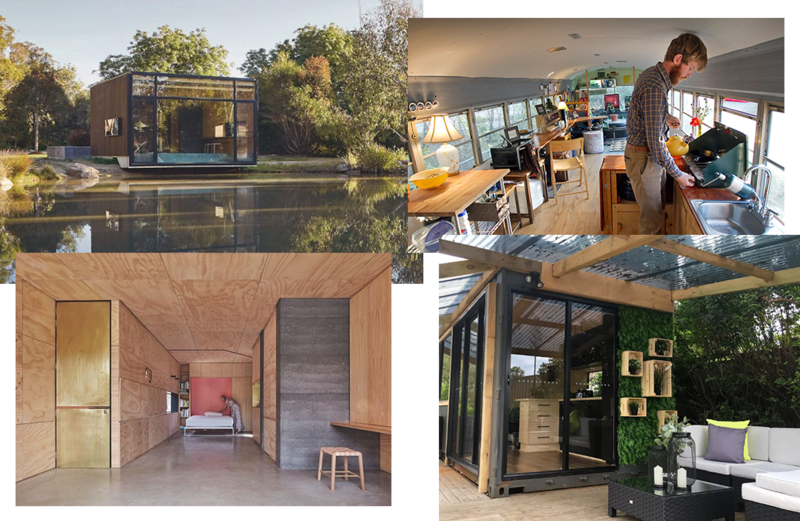 From cabins on wheels to shipping containers, there’s really no limit to how far the imagination can stretch when building a tiny house, and the endless possibilities have architects and designers alike absolutely brimming with crafty and creative ideas. Thinking small? Here are just a few tiny but mighty houses we love, that you will desperately want to live in. This mobile beauty was built by owner Alek Lisefski, and cost the teensy price of $30,000 for the entire project. He’s managed to bring a sense of space to his adorable 64-cubic metre home with lofty ceilings, dual-purpose furniture and itty-bitty appliances. There’s even a space for the dog! Combining a minimalist aesthetic with a hint of southern charm, the aptly named weeHouse might have less than 46 square metres of space, but the thoughtful pre-fabricated design delivers a feeling of spaciousness by bringing the outside in, with lots of glass and a step-up foundation to instantly connect you with the surrounding scenery. Ah, bliss. Located at Camp Wandawega, this awesome 3-storey treehouse is something straight out of a fairy tale, but designed for adults. Built around massive elm tree, the treehouse features three levels with a lower ground deck, living area and two sleeping lofts. Fitted out with a rope swing, hammock, and library, it’s the perfect common area for happy campers to just chill out. Deliberately non-specific in design, Balnarring Retreat is exactly that—a tiny retreat from everything and everyone, nestled amongst nature. Celebrating raw materials and a distinct lack of technology, walls and furniture within this tiny house can quite literally be folded and manipulated like origami into different spaces with different purposes—from a yoga studio to bedroom to home office. Shipping container homes are very on trend, but if building your own isn’t an option just yet, why not enjoy someone else’s? This ‘moody industrial’ luxury shipping container conversion is kitted out with plywood and matte black fixtures, plus a spacious deck to relax on. If you’re looking for the perfect romantic getaway, you’ve found it. While living in a converted bus might not sound super appealing at first, once you see Rosie in action you’re bound to change your mind. Purchased on Craigslist as a first home, the newly-married owners paid the low low price of $3000 for the old bus and turned it into a first-class open plan home that they can take anywhere and everywhere. If you're house is tiny, you might want to check out some of these space saving hacks.